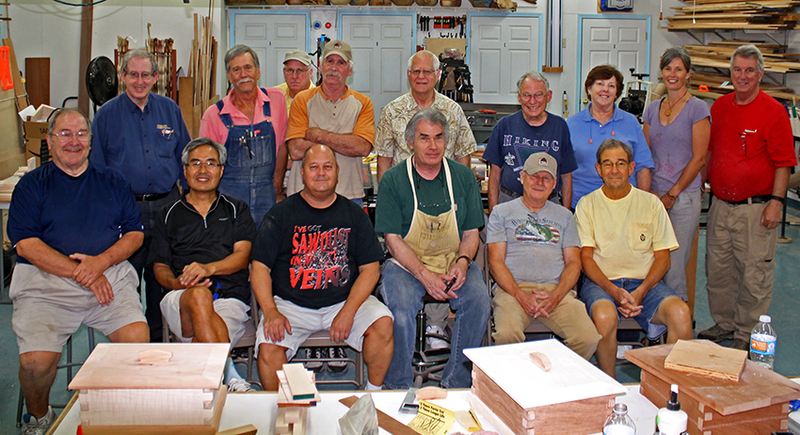 There are hundreds of woodworking clubs in the United States, and last week I spent three days + one morning in the company of members of one of the best, the Gwinnett Woodworkers Association. Many of the faces were familiar from the last time I visited to conduct a SketchUp class four years ago. If you’re in or near the north east corner of Atlanta you should check them out. 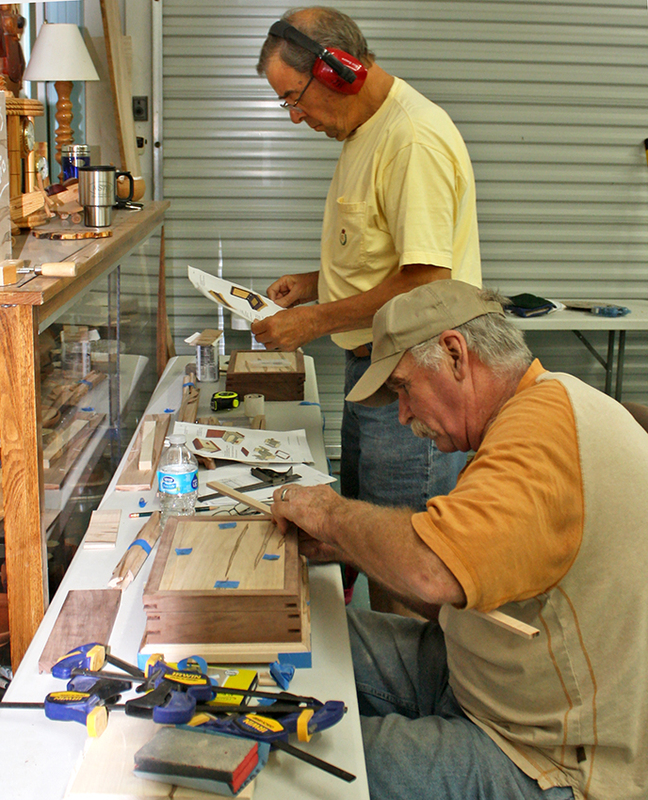 They meet regularly on Saturdays at Peachtree Woodworking Supply. This time around we met at the shop of Rob Austin (on the left in the photo). Rob’s shop is in a free-standing building behind his home and is beautifully set-up and incredibly well equipped. His generosity and hospitality made this class (and a lot of other things for the club) possible. 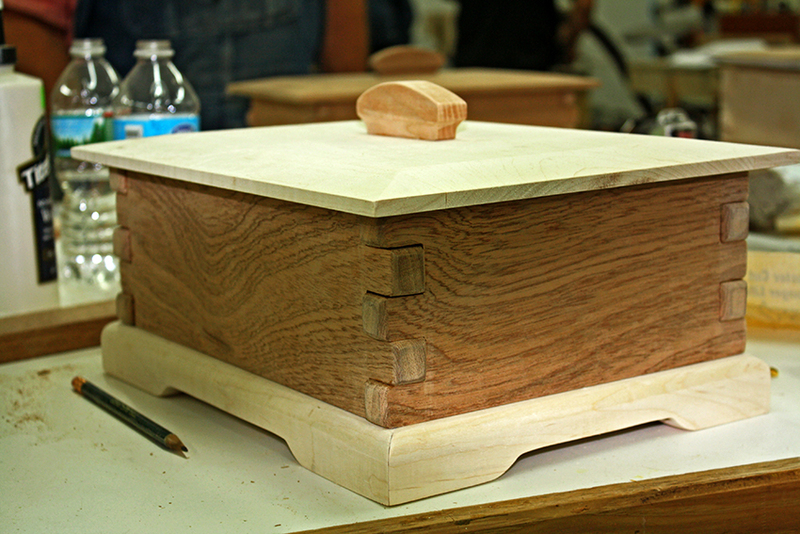 The idea of the class was to explore joinery through the creation of a project. 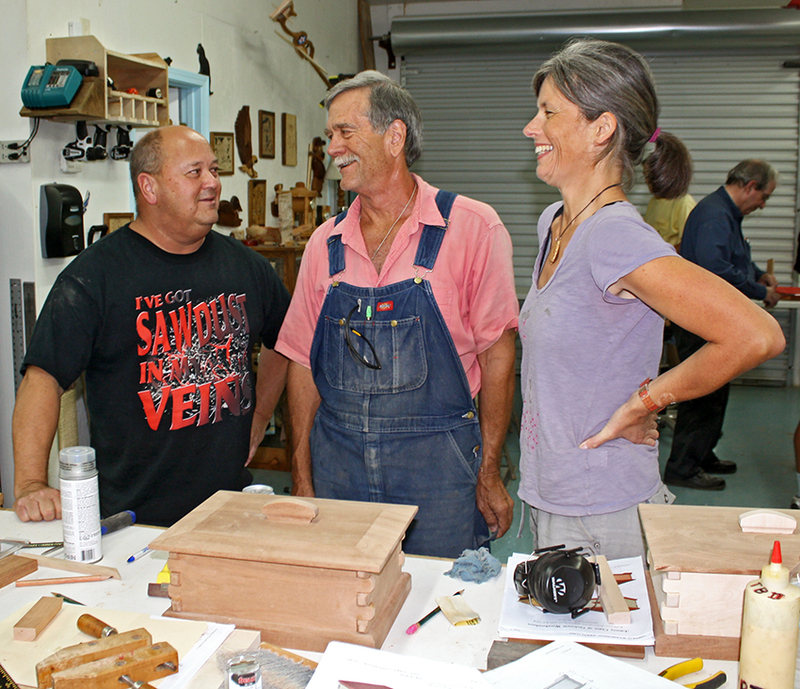 Participants chose one of four box designs to work on during the three-day class. When I designed the boxes I included different techniques for assembling the sides, bottoms and tops, and traditional and not-so-traditional decorative elements. We covered a lot of territory including router table dovetails, irregularly space extended finger joints (as in Greene & Greene furniture) and splined miters. Click here to see images of some of the designs. At lunchtime (provided by another GWA member Ricky Alexander) each day I showed slides of my work, and original pieces from my study of the American Arts & Crafts period of the early 20th century. Before and after lunch we explored different ways to set up the table saw and router tables to accomplish the tasks at hand. The group kept me on my toes and I was impressed with the way the members worked together. You know it’s a good bunch of folks when they watch out for one another and work together at problem solving. During the class one of the participants commented that we “weren’t using the standard jigs and methods that you usually see”. I replied that the average woodworker doesn’t go beyond those, and only produces average work. The idea here was to go a step or two beyond and take things to a higher level. I think we succeeded, making boxes that required all of us to think outside the box. The Gwinnett Woodworkers Association has a YouTube channel, and if you subscribe you can see video from this class as soon as it gets edited and posted online. On Saturday morning I gave a presentation to the entire club, and video from that will be available as well, as soon as the volunteer video editor has it ready. My thanks go out to the Gwinnett Woodworkers Association, especially Bob Brokaw for doing all the legwork, Rob Austin for allowing us to use his shop, Ricky Alexander for making sure we didn’t go hungry and the entire group seen in the photo above for spending a few days working with me. Hi Bob… what an amazing time you had with this group. I’d like to know how I can find a woodworking association near me. Any ideas on how I can search for one? Thanks! Not sure how up to date these are. This is how a dear friend of mine got into woodworking! It is very helpful to have a group of likeminded people and possibly even mentors to help you get started. Great to learn that the Gwinnett Woodworkers Association strives for excellency right from the start. Makes no sense to take shortcuts in my opinion. You should be proud of your work!